Happy New Year! I’m catching up on a LOT of updates for this site. I’ve got tons to share and just trying to find the time to get it all online. I had a great work session with Matt R. where we disconnected the DCC system and hooked up a regular power pack to the layout so I could run some of my non-DCC-equipped trains. This served a couple purposes. One, it was cool! Two, it gave me a chance to see how the “biggest” steam engine I have (a B&O Q1c Mikado) did going around the curves of the layout. What did I learn? Well, some of the curves, especially at the Junction are WAY too tight for the Mike. 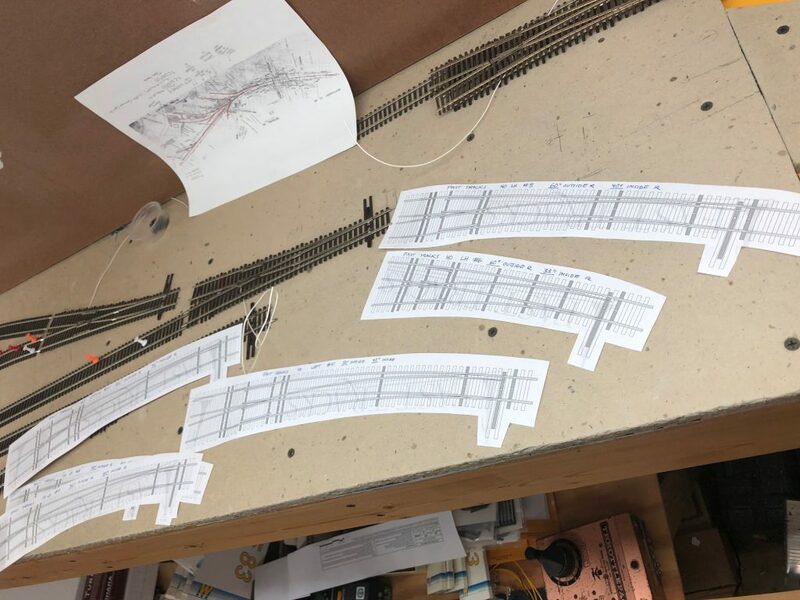 But, I also had some great brainstorming, realizing that I had laid out the track at the Junction in a way that wasn’t prototypical and could be done better to ease the curve and allow for a more prototypical arrangement. 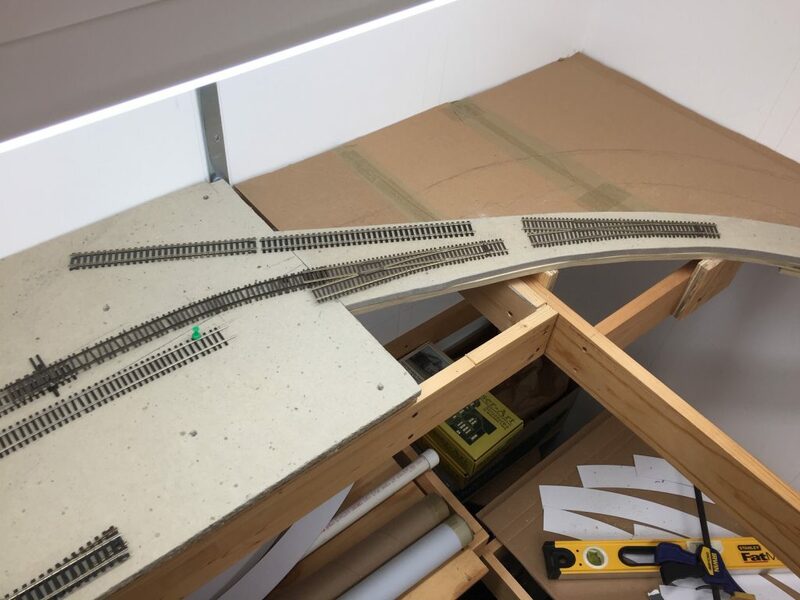 I’ve ripped out about 80% of the track I need to remove and am in the process of redoing the roadbed and arranging the tracks. I need to test fit a couple #8 RH turnouts, so that is the next step. But, the big thing is that I’ve laid track all the way to Bethesda! (yay!) The bad news, I hit a snag. The curve coming into Bethesda is a broad compound curve. On the prototype there were three turnouts. From right to left, a turnout that served Griffith Fuel & Oil and included a long coal trestle. Next is another siding. I’m not certain what this served. 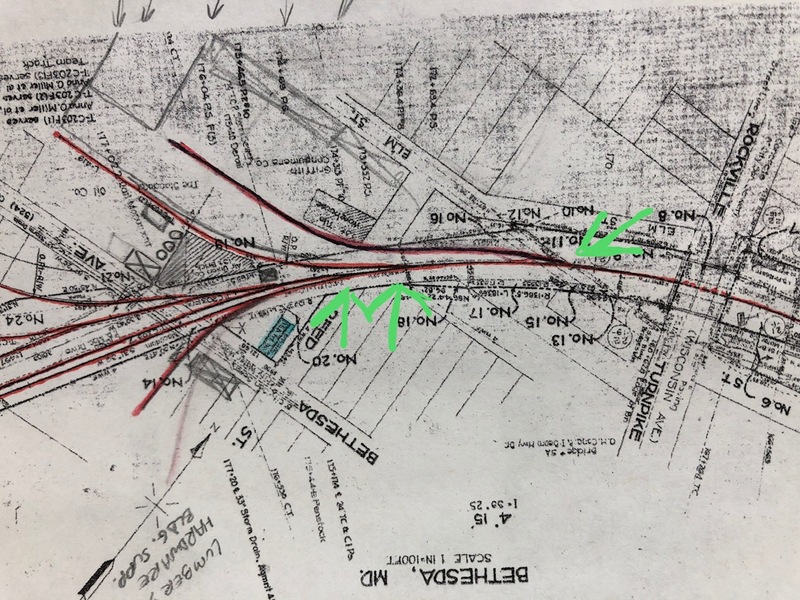 The third turnout is the lead for the passing siding, which also led to more sidings serving Maloney Concrete, Frito-Lay and some team tracks among others. But, upon closer inspection, and now that I actually have a lead into Bethesda, I realized these just do not work for me. The #6’s are way too abrupt. The “main” would become the “diverging” route on the turnouts. This looks way too wonky to me. The curve of the #6 is very sharp and it doesn’t flow well, even with bending. I tried some of the broadest curved turnouts that Walthers/Shinohara offers and they are too tight. So what’s left? Are you hearing that? 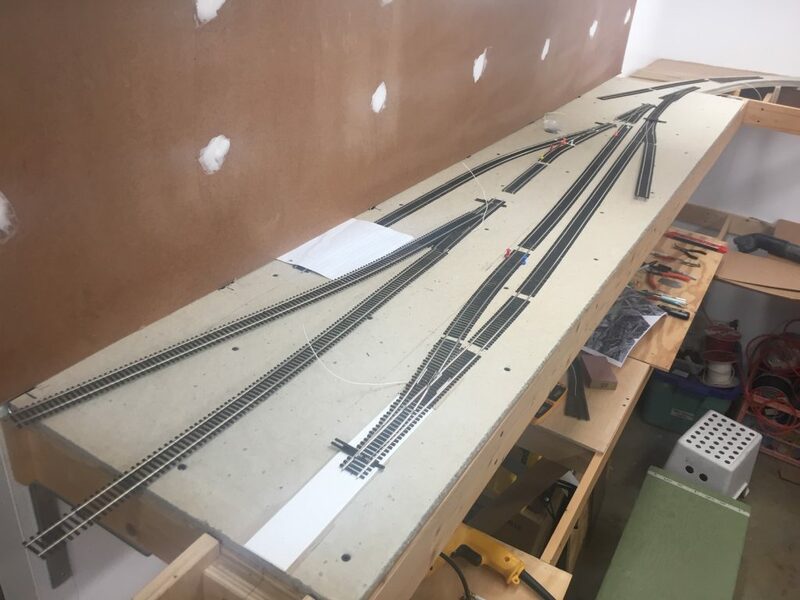 It’s the call of the old-school model railroader… that’s right; Hand laying track! 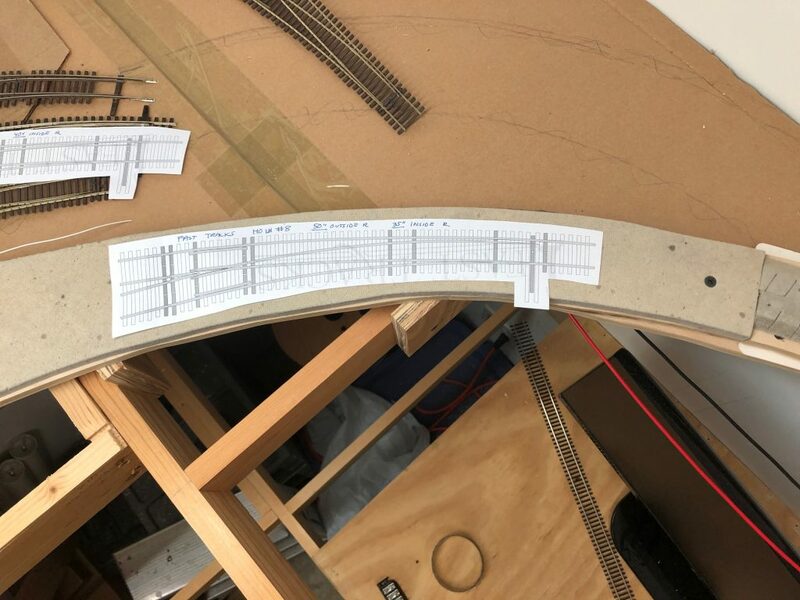 Next steps: Now that I’ve got the curve drawn on the roadbed, I’m going to cut and remove the roadbed section where the curves are and mount it to a small piece of plywood. This will allow me to take it to the workbench and work there versus on the layout itself. I then need to start test fitting ties and figure out the layout of the turnouts themselves. Alternatively, I may just build three turnouts of the same size and then place them together like sectional track. This will also allow for simplicity, but I won’t be able to achieve the nice compound curve I am following. Either way, I have my work cut out for me this weekend. As a final note, next weekend (Feb 2-3) will be the Great Scale Model Train Show at Timonium, MD. I will be there and will have some table space to sell some old equipment. If you are going, drop me a line so we can meet up and say hello!